Citrus reticulata Orange blossoms and fruit. Citrus is a genus of flowering plants in the family Rutaceae (orange family) and a common name for edible fruits of this genus (and sometimes related genera). Originating in tropical and subtropical southeast Asia, these plants are among the oldest fruit crops to be domesticated (Katz and Weaver 2003). Citrus fruits are a distinctive berry with the internal parts divided into segments and include oranges, lemons, limes, citrons, grapefruit, pomelos (pummelo, pommelo), and mandarins (tangerines). Citrus is likely the most widely planted fruit for direct human consumption in the world (Katz and Weaver 2003). While fruit is a mechanism for plant multiplication, citrus fruits also provide human beings with a variety of aesthetic and sensual experiences (the beauty of the flowers and taste of the fruits), as well as nutritional values. Citrus fruits are notable for their fragrance, partly due to flavonoids (secondary metabolites) and limonoids ( phytochemicals) contained in the rind, and most are juice-laden. The juice contains a high quantity of citric acid giving them their characteristic sharp (tart) flavor. They provide important health benefits, being good sources of vitamin C, flavonoids, fiber, and folic acid. Citrus taxonomy is complex and unsettled. It is generally assumed that there were three fundamental citrus species and all others arose from hybridization events, but which of the hybrids are considered species varies widely according to the classification scheme used (Katz and Weaver 2003). 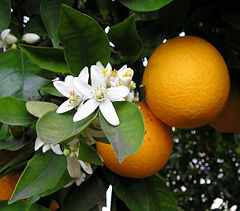 Because of the taxonomic uncertainly, which extends to the subfamily Aurantiodeae, edible fruits of related genera also may be called citrus; kumquat, for example, is in the taxon Fortunella, which some authorities place as a separate genus, while others place it as a subgenus of Citrus. Citrus fruits may be consumed fresh, as juice, or preserved. The citrus plants are small trees or large shrubs, reaching 5 to 15 meters tall, with spiny shoots and alternately arranged evergreen leaves with an entire margin. The flowers are solitary or in small corymbs (a branched cluster of flowers with lower flowers having longer stems). Each flower is two to four centimeters in diameter, with five (rarely four) white petals and numerous stamens; they are often very strongly scented. The distinctive fruit is a hesperidium, a specialized berry with the internal fleshy parts divided into segments (typically 10 to 16) and surrounded by a separable rind (Katz and Weaver 2003). The herperidium is globose to elongated, 4 to 30 centimeters long, and 4 to 20 centimeters in diameter. The rind is leathery and the segments, or "liths," are filled with pulp vesicles. The name herperidium is derived from classical mythology, based on the golden apples grown in the garden of the Hesperides, the daughters of Hesperus (Katz and Weaver 2003). The plants prefer tropical to temperate climates, and although originally native to Asia, are now widespread in appropriate climates in South America, Central America, southern parts of North America, Middle East, Africa, and Australia. The taxonomy of the genus is complex and the precise number of natural species is unclear, as many of the named species are clonally-propagated hybrids, and there is genetic evidence that even the wild, true-breeding species are of hybrid origin. Cultivated Citrus may be derived from as few as three or four ancestral species. Katz and Weaver (2003) claim that the generally accepted view is that there were three primordial Citrus species—Citrus medica (citrons), Citrus maxima (pumelos), and Citrus reticulata (mandarins)—and that all other types of citrus rose from single or sequential hybridization events between these species or their offspring. The hybridized types of citrus may or may not be recognized as species according to different taxonomies. Thus, anywhere from 3 to 170 species are recognized, with the commonly used system of Swingle recognizing 16 species (Katz and Weaver 2003). The genus Citrus is generally divided into two subgenera, Citrus and Papeda (Katz and Weaver 2003). The subgenera Citrus contains edible citrus fruits, while the Papeda consists of the papedas, which have fruits with high concentrations of acrid oil, causing a bitter, unpleasant flavor and thus rendering them inedible (Katz and Weaver 2003). 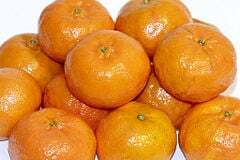 Mandarins are often referred to a tangerines, which Katz and Weaver (2003) consider to be an incorrect use, since tangerine was used in the nineteenth century to designate only one type of mandarin, a Mediterranean type, with the word based on the city of Tangier. Recent research has suggested that the closely related genus Fortunella, and perhaps also Poncirus and the Australian genera Microcitrus and Eremocitrus, should be included in Citrus. In fact, most botanists now classify Microcitrus and Eremocitrus as part of the genus Citrus, and Fortunella (which includes kumquats) is considered by some a subgenus of Citrus. Katz and Weaver (2003) believe the citron originated in northern India and spread later to China, and that the sweet orange originated in southern China, where both mandarins and pumelos were planted together, spreading later to India. The oldest mention of citrus traces to the Yu Kung of China, a book of tributes to the Emperor Ta Yu, who lived from about 2205 to 2197 B.C.E. (Katz and Weaver 2003). The earliest known mention of citrus (citrons and lemons) in Indian writings is from around 800 B.C.E. in a collection of devotional texts, the Vajasaneyi samhita (Katz and Weaver 2003). A Chinese book by Han Yen Chih, dated to 1178 C.E., mentions 27 varieties of citrus (Katz and Weaver 2003). Citrus was brought by the Spanish and Portuguese to to the Caribbean, from where it was introduced to North and South America. It was brought by the Portuguese to Australia and West Africa, although probably first to Africa by Arab or Indian traders (Katz and Weaver 2003). All commercial citrus cultivation uses trees produced not by seeds but by grafting the desired fruiting cultivars onto rootstocks selected for disease resistance and hardiness. Although citrus can be grown from seed, there are such disadvantages as the fact that seedling trees do not bear fruit until nearly a decade old, seeds and young trees are vulnerable to disease and unfavorable soil conditions, and, because citrus trees hybridize very readily, sometimes trees produced by seeds are not true-to-type with the mother tree (Katz and Weaver 2003). For example, seeds grown from Persian limes can produce fruit similar to grapefruit. Thus, most citrus is produced by budded (grafted) trees (Katz and Weaver 2003). The color of citrus fruits only develops in climates with a (diurnal) cool winter. In tropical regions with no winter, citrus fruits remain green until maturity, hence the tropical "green orange." The lime plant, in particular, is extremely sensitive to cool conditions, thus it is usually never exposed to cool enough conditions to develop a color. If they are left in a cool place over winter, the fruits will actually change to a yellow color. Many citrus fruits are picked while still green, and ripened while in transit to supermarkets. Citrus trees are not generally frost hardy. Citrus reticulata tends to be the hardiest of the common Citrus species and can withstand short periods down to as cold as −10 °C, but realistically temperatures not falling below −2 °C are required for successful cultivation. A few hardy hybrids can withstand temperatures well below freezing, but do not produce quality fruit. A related plant, the Trifoliate orange (Poncirus trifoliata) can survive below −20 °C; its fruit are astringent and inedible unless cooked. The trees do best in a consistently sunny, humid environment with fertile soil and adequate rainfall or irrigation. (Older "abandoned" citrus in low valley area may suffer, yet survive, the dry summer of Central California Inner Coast Ranges. Any age Citrus grows well with infrequent irrigation in partial/understory shade, but the fruit crop is smaller.) Though broadleaved, they are evergreen and do not drop leaves except when stressed. The trees flower (sweet-scented at 2 to 20 meters) in the spring, and fruit is set shortly afterward. Fruit begins to ripen in fall or early winter months, depending on cultivar, and develops increasing sweetness afterward. Some cultivars of tangerines ripen by winter. Some, such as the grapefruit, may take up to 18 months to ripen. 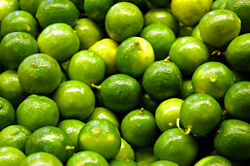 Limes in a grocery store. Major commercial citrus growing areas include southern China, the Mediterranean Basin (including Southern Spain), South Africa, Australia, the southernmost United States, and parts of South America. In the U.S., Florida, Texas, and California are major producers, while smaller plantings are present in other Sun Belt states. Citrus trees grown in tubs and wintered under cover were a feature of Renaissance gardens, once glass-making technology enabled sufficient expanses of clear glass to be produced. The Orangerie at the Palace of the Louvre, 1617, inspired imitations that were not eclipsed until the development of the modern greenhouse in the 1840s. An orangery was a feature of royal and aristocratic residences through the seventeenth and eighteenth centuries. In the United States, the earliest surviving orangery is at the Tayloe House, Mount Airy, Virginia. 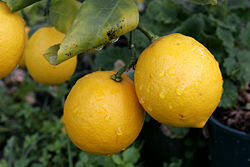 Some modern hobbyists still grow dwarf citrus in containers or greenhouses in areas where it is too cold to grow it outdoors. Consistent climate, sufficient sunlight, and proper watering are crucial if the trees are to thrive and produce fruit. Compared to many "normal green" shrubs, citrus better tolerates poor container care. For cooler winter areas, lime and lemon should not be grown, since they are more sensitive to winter cold than other citrus fruits. 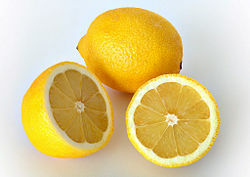 Lemons are commercially grown in cooler-summer/moderate-winter coastal Southern California, because sweetness is neither attained nor expected in retail lemon fruit. Tangerines, tangors, and yuzu can be grown outside even in regions with sub-zero winters, although this may affect fruit quality. Hybrids with kumquats (citrofortunella) have good cold resistance. Citrus plants are very liable to infestation by aphids, whitefly, and scale insects (e.g. California red scale). Also, rather important are the viral infections to which some of these ectoparasites serve as vectors such as the aphid-transmitted Citrus tristeza virus, which when unchecked by proper methods of control is devastating to citrine plantations. The foliage is also used as a food plant by the larvae of some Lepidoptera species, including the common emerald, double-striped pug, giant leopard moth, Hypercompe eridanus, Hypercompe icasia, and Hypercompe indecisa. The European brown snail (Helix) can be a problem in California. Many citrus fruits, such as oranges, tangerines, grapefruits, and clementines (type of mandarin), are generally eaten fresh. They are typically peeled and can be easily split into segments. Grapefruit is more commonly halved and eaten out of the skin with a utensil. Orange and grapefruit juices are also very popular breakfast beverages. 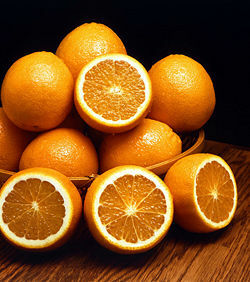 Oranges are used in many foods. More astringent citrus, such as lemons and limes are generally not eaten on their own. Though Meyer Lemon (thought to be a cross between a true lemon and a mandarin orange or sweet orange) can be eaten "out of hand," it is both sweet and sour. Lemonade or limeade are popular beverages prepared by diluting the juices of these fruits and adding sugar. Lemons and limes are also used as garnishes or in cooked dishes. Their juice is used as an ingredient in a variety of dishes and can commonly be found in salad dressings and squeezed over cooked meat or vegetables. A variety of flavors can be derived from different parts and treatments of citrus fruits. The rind (peel) and oil of the fruit is generally very bitter, especially when cooked. The fruit pulp can vary from sweet and tart to extremely sour. Marmalade, a condiment derived from cooked orange and lemon, can be especially bitter. Lemon or lime is commonly used as a garnish for water, soft drinks, or cocktails. Citrus juices, rinds, or slices are used in a variety of mixed drinks. The skin of some citrus fruits, known as zest, is used as a spice in cooking. The zest of a citrus fruit, preferably lemon or an orange, can also be soaked in water in a coffee filter, and consumed as a beverage. Citrus is good source of vitamin C (ascorbic acid), which is needed for a range of essential metabolic reactions and is a critical cofactor in the formation of collagen. 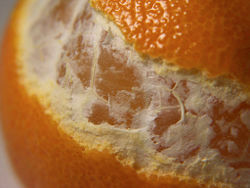 The disease scurvy, traced to vitamin C deficiency, results when defective collagen prevents the formation of strong connective tissue. The orange is also used in producing vitamin C pills. Scurvy can be prevented by having ten milligrams of Vitamin C a day. An early sign of scurvy is fatigue. If ignored, later symptoms are bleeding and bruising easily. Limes were a necessary supply on early ocean sailing vessels traveling long distances to prevent sailors from getting scurvy, leading to their being called "Limeys." Citrus is also a good source of vitamin A, dietary fiber, and folic acid. Folic acid is important for blood cell formation and growth, as well as liver disease prevention. Folic acid is also valuable for pregnant women as it aids in the prevention of neural tube defects, such as spina bifida, in the developing fetus. 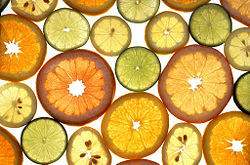 In addition, citrus is a source of various limonoid products, which have been shown to reduce tumorgenesis under experimental conditions, and a source of carotenoids, such as lycopene, associated with decreased risks of heart attacks and general antioxidant activity (Katz and Weaver 2003). Some citrus has a high pectin content, which contributes to soluble fiber consumption, which in turn is linked to cardiovascular health and reduced risk of certain cancers (Katz and Weaver 2003). Lemon juice, like vinegar, is used to relieve the pain of bee stings, when applied directly to the affected skin. Janick, J. 2005 Lecture 32: Citrus. Purdue University Retrieved April 6, 2007. Nicolosi, E., Z. N. Deng, A. Gentile, S. La Malfa, G. Continella, and E. Tribulato. 2000. Citrus phylogeny and genetic origin of important species as investigated by molecular markers. Theoretical and Applied Genetics 100(8): 1155-1166. Reuther, W., E. C. Calavan, and G. E. Carman. 1989. The Citrus Industry, Volume V, Chapter 5. University of California, Division of Agricltural Sciences. ISBN 0931876877 Retrieved April 6, 2007. Reuther, W., H. J. Webber, and L. D. Batchelor. 1967. The Citrus Industry, Volume I: History, World Distribution, Botany, and Varieties. University of California, Division of Agricltural Sciences. Retrieved April 6, 2007. Reuther, W. L. D. Batchelor, and H. J. Webber. 1968. The Citrus Industry, Volume II: Anatomy, Physiology, Genetics, and Reproduction. University of California, Division of Agricltural Sciences. Retrieved April 6, 2007. This page was last modified on 22 May 2013, at 15:48.